What’s a weary Aussie traveller to do after a few hours and a few hundred kilometres on the road? Stagger from the car – reeling from too much sitting and legs crossed since the last few sips of water – and head straight for the loo, of course! Or the nearest tree … It’s an Aussie outback traveller’s rite of passage!! So how desperate would you be if you’ve just crossed the universe, and you’re a gazillion light years from home?? Appropriate facilities – or intelligent life forms – aren’t always easy to find in this corner of the universe, so local and intergalactic travellers will be relieved (in more ways than one) to learn that Wycliffe Well, deep in the heart of the Northern Territory, and self-styled UFO capital of OZ doesn’t just cater for mere earthlings! While the simple earth technology might not meet home galaxy standards, I would defy ANY traveller to wander amongst the random statues and murals tastefully adorning the grounds and not find something to make one feel at home! Sceptics may scoff at tiny Wycliffe Well’s high per-capita UFO sighting rate – in 2002 the Sun Herald ranked it 5th in the world for UFO activity – and the uninformed will almost certainly put it down to substance abuse overindulgence; but who’s to say this isn’t an alien home away from home?? Yes, it’s a pig. Why? WHY??!! After the wonders we experienced on our 2008 visit, I suspect extraterrestrial navigation systems throughout the universe will be busy programming in Wycliffe Well’s coordinates!! AND … maybe one day Wycliffe Well will have the first certified amenities block in OZ to meet intergalactic standards! I guess I’ll just have to hold on ’til then!! « I’m Walking on Sunshine … AND Giveaway Winner! @wsn – WELL … I guess you should know!! That is a brilliant bathroom, really different and interesting. Great find. @Diane – Woo hoo! Maybe they should be sister cities??!! My ‘friend’ is probably getting lonely without me … feel free to drop in and cheer him up!! Another must see. It’s right up there with the town of Vulcan, Alberta. Which boasts a genuine landing pad for the Enterprise! And an almost life-sized model of same. BTW who is the large, muscular ‘friend’ you are posing with? He attached???! @Whitesnake – Haha, and give away the secret of the alien portal??!! Very cool. Thanks for sharing with Weekend Walkabout. @Gladys – Hey, thanx for dropping in! Would LOOOOVE to see your Lao bear loo! Send me a pic for a guest post?? @Sallie – Hahaha, love you too girlfriend! I still find it weird that I can post something downunder and have someone WAAAAAAY over the other side laugh! The power … the power!!! I’ve always had lots of reasons why I’d love to visit Australia someday, but until I became a fan of your blog, I never knew that the outdoor toilets were one of those reasons! Hope you had a great Christmas!! @Angela – Whatever the rock is, it looked amazing!! Hope your Xmas was excellent too! @Kath – Or in my case, over and over again!! Different ones, of course … Merry Xmas! @icedgurl – Trekking? MY blog?? HHHMMMmmm… note to self – look up ‘trekking’! @Saucy Kod – I’ve set the bar impossibly high … nothing like a challenge, huh? LOVE your slang – our version is ‘you and your scumbag mates’!! @Draft Queen – yeah, other stuff like the Uluru and the Barrier Reef are just minor distractions between pit-stops! @Betty – thanx, and same to you! @Joan – Thank you! I’ve made it out the other side of Xmas – hope you have too!! I guess the folks there have to do *something* to entertain themselves and public toilets are one of those things in life that everyone needs to use at least once….. The aliens will be so pleased! They’ve given up on Roswell, New Mexico–not a welcoming rest stop in sight. The little rock is from the swiss Jura mountains. It’s limestone. I wish you and your family a Marry Christmas. Merry Christmas Red. I hope you have a wonderful day … know you will coz you have such a fun personality every day. Happy Holidays to you n Pilchard, “Buddy Wasisname and the Other Fellers” – another tidbit of Maritime Slang. trekking your amazing blog! keep blogging! happy holidays! @Fruitcake – True, but I wonder how many aliens actually look like that? Still … it’s a step in the right direction! @Sallie – Well … why not give him a free email subscription for Xmas? He doesn’t need to know it’s free … just click on the email thingy and put in his email address – all he has to do is confirm it!! Too easy!!! @greg scott – HHHMMMmmm… do I detect a trace of cynicism?? It’s weird all right – but is it wonderful? You decide!! @Dianne – Thank you so much! One of my first posts was about Wycliffe Well, but I’d forgotton all about the loo until I uncovered the pix the other day!! @Charlotte – Welcome and thanx! Look forward to your next visit!! These posts are so funny! Love the buildings, but only you could make it so laugh-out-loud funny! Bill asked me what I was laughing at and looked at me strangely when I told him (he needs to read you!). Looks like a fun and quite unusual place. Just stopped by from BPOTW. I’ll be on the look out for more of your posts. You never cease to amaze me with your loo finds and I would think this one tops the cake . I hope you & Pilchard have the very best Christmas – & thanks for the many laughs in 2011. The Male/Female paintings on the entrance portal must be reassuring for aliens – a good picture can cross an infinite number of linguistic barriers. @Alessandra – Same to you, my friend. Hope the earthquake isn’t anywhere near you. @Rubye – Even more funny/cute in reality! And you’re right – it’s SO weird to earthlings, the aliens MUST feel right at home! @Windsmoke – Haha, you’re too kind! But I have no plans to move there – yet!! @diane – OMIGOD!! I never thought of the alien toilet block as a portal!!! @Natural View – Haha, you’re right! Trees and bushes are the usual places – but look out for the snakes!! @PDP – HHHMMMmmm… maybe they’re now getting more aliens visiting than cars!!! @Courtney – They’re just getting even more weird and wonderful! 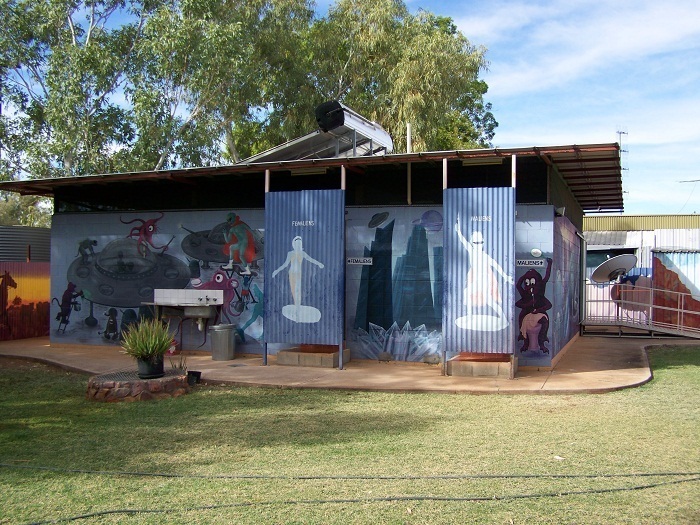 @Magsx2 – Its unique quirkiness makes it my all time fave OZ spot- and it’s just down the road from the wonderful Devils Marbles! @Beach Bum – do it! DO IT!!! Oh, hang on- not quite sure how to organise an alien abduction!! @FrankandMary – Haha! Yes, no proof without a pic!! And now that you mention it, I guess the pig is just as probable as the Hulk!! Its an alien oasis in our own back yard what alien wouldn’t want to stay here for a night while traveling across the universe with Red as your hostess with the mostess :-). What a lovely home for the aliens away from home. This is funny cute Red. Marry Xmas and Happy New Year Red!! LOVE IT! Another awesome potty spot you’ve found! Haha! that’s quite something, no wonder they have so many UFO sightings, any passing ship would have to do a fly by to see ‘what the heck’ it was all about! I hope you have a fabulous Christmas Red, take care. That looks like fun, nice shots. I’m not sure if you’d prefer the 37 C you’ll be getting, or the -20 we had at our house this morning, neither is pleasant to be outside in! I think that I would think twice before entering. Who knows where you might end up. A great one for your collection. I vote for the substance abuse ;o. Hot dog! I finally found a cheap way down to you all’s side of the world, as long as I get abducted and can catch a ride by aliens doing the tourist thing here in the States. That is unreal, it’s definitely corny, but you have to give 10 out of 10 just for the uniqueness of it all. LOL. That’s the most amazing toilet yet!! How do you find these things?